Ayushman Bharat- National Health Protection Mission was first introduced in the Union Budget 2018-19. In the Union Budget 2018-19, the Union Minister for Finance and Corporate Affairs, Mr Arun Jaitley announced the Ayushman Bharat programme for a new India–2022. 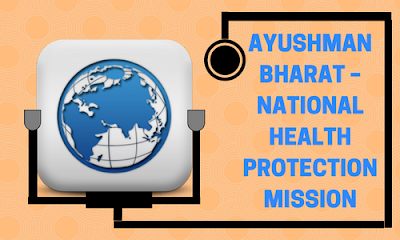 The Union Cabinet chaired by the Prime Minister Narendra Modi has recently approved the launch of Ayushman Bharat- National Health Protection Mission (AB-NHPM). AB-NHPM will be a centrally sponsored scheme having a benefit cover of Rs 5 lakh per family per year. AB-NHPM will entail the already existing/sponsored health schemes- RSBY (Rashtriya Swasthya Bima Yojana) and SCHIS (Senior Citizen Health Insurance Scheme). This programme will target around 10.74 crore poor and vulnerable families based on SECC (Socio-Economic Caste Census) database. Since the scheme is dynamic in nature, it would be able to incorporate any future changes in the SECC data. This scheme will be rolled out across all states/UT and all districts in order to cover all the targeted beneficiaries. The entitlement for this scheme would be based on the deprivation criteria mentioned in the SECC database. a) Families having only one room. b) Families having no adult member aged between 16-59.
c) Households having female heads of the family with no adult male member aged between 16-59.
d) Families having any disabled member and no physically abled adult member. f) Landless households deriving their income from manual labour. 11 defined occupational categories (for urban areas) are entitled under this scheme. It will cover almost all secondary care (which involves hospitalisation for non-critical ailments) as well as tertiary care procedures (which involves treatment of critical ailments). In order to ensure that nobody is left out, the scheme will have no cap on the size of the family and no age factor. Pre and post hospitalisation expenses would be included in the benefits cover provided under this scheme. All pre-existing conditions of the people will be covered from day one of the implementations of the policy. A defined transport allowance per hospitalisation will also be paid to the beneficiary under this scheme. The benefits of the scheme are portable all over India. Therefore a beneficiary covered under this scheme can take benefits from any public/private empanelled hospitals across the country. In order to control costs, the payments for the treatment will be done on package rate (which would be defined by the Government in advance). All the costs associated with the treatment will be included in these package rates. It will basically be a cashless, paperless transaction for all the beneficiaries. This transaction would be facilitated in partnership with NITI Aayog and an IT platform would be made operational to entail this. This would be further backed by a well-defined Grievance Redressal Mechanism. As far as the state requirements are considered, states/UTs will have the flexibility to modify these package rates within a limited bandwidth. The Central and State Government will share the expenditure incurred in premium payment. This expenditure will be shared in a specified ratio (60:40) as per the guidelines of the Ministry of Finance. In order to implement this scheme, the states are required to have a State Health Agency (SHA). A similar structure is required at the district level as well. The timely transfer of funds from the Central Government is required to ensure that the funds reach the State health Agency on time. This can be done through an escrow account directly. According to a report by NSSO 2015 (National Sample Survey Office) during the last ten years, it was observed that the in-patient hospitalization expenditure has increased about 300% i.e. the average medical expenditure for the treatment (in private hospitals) was about four times than that of the public hospitals. Moreover, around 80% of the expenditure in India is met by out of pocket. Around 68% people in rural households depend on their income/savings whereas 25% depend on borrowings for any kind of expenditure on hospitalisations. In urban households, 75% of people depend on their income/savings whereas 18% depend on borrowings. This showed that the out of pocket expenditure was over 60% thus leading to 6 million families getting poorer due to the health conditions. It will have a major impact on reducing the out of pocket (OOP) expense in order to prevent people going beyond the poverty line. This scheme would cover the poor and vulnerable population of India (which is nearly 40% of the total population). This would help in catering to their unmet needs which are ignored due to a lack of financial resources. All the secondary and tertiary care will be covered under this programme. It will provide a coverage of Rs 5 lakh for each family. This is an effective way to increase the access to quality health services. AB-NHPM will lead to a timely treatment of the beneficiaries thus leading to an improvement in the quality of life.